WHERE DO OUR CANE TOADS COME FROM? The cane toad has mounted a successful invasion in Australia and many other countries - but where did the toad come from originally? These toads have a wide native range in Central America and South America. Studies on DNA characteristics of Aussie toads suggest that they descend from a group of toads originally collected from South America (perhaps French Guyana). These were taken to Puerto Rico, then toads from that island were taken to Hawaii – and finally, 101 Hawaiian toads were brought to Australia to form the beginnings of the invasion. 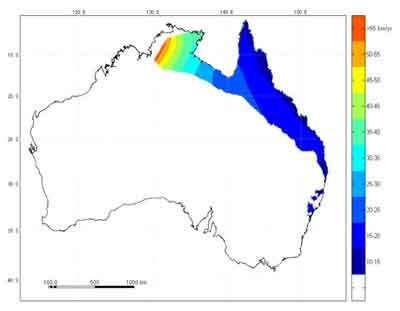 The cane toad's native range (in purple). Map by Christa Beckmann. WHY WERE CANE TOADS BROUGHT TO AUSTRALIA? In the 1930’s, cane-growers in Queensland were very concerned about crop damage due to beetles – especially the frenchi beetle and the greyback beetle. So the Queensland Department of Agriculture looked into possible solutions. The chemicals available to kill insects at that time were very nasty – even DDT was yet to be invented – so “less destructive” approaches were examined. Based on reports of cane toad introduction helping to increase yields in Hawaiian sugar cane crops by eating beetles, Reginald Mungomery organized the import of toads. It’s easy to criticize scientists like Mungomery - with the benefit of hindsight, bringing in toads was a REALLY bad idea! But we think that’s a bit tough – if they were indeed looking for a more ecologically sustainable solution to beetle damage than harmful chemicals, all we can really say is that they tried to do the right thing, but got it awfully wrong. HOW FAST ARE THE TOADS MOVING THROUGH AUSTRALIA? 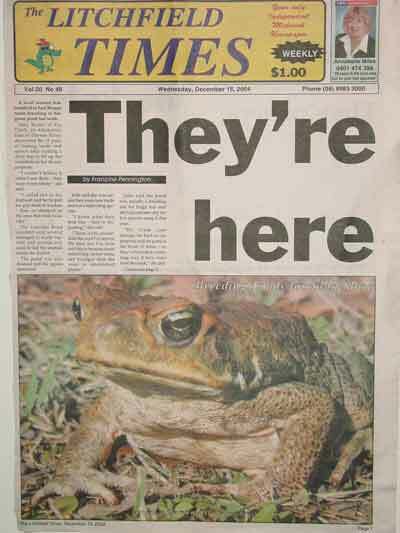 One of the convenient things about studying cane toads is that the general public really cares about them, and so people watch out for the advancing toad invasion front. As a result, we have really detailed information – from postal surveys and so forth – to show exactly how fast the toads have spread through Australia, and where they have gone. Toads have moved faster and faster through tropical Australia. Map by Mark Urban. Our analyses show a really clear pattern. In the early years (up to the 1960’s or so), the toad invasion front advanced fairly slowly – about 10 km each year. But then it began to speed up, and has kept accelerating. The front now moves at about 40 to 60 km per year, and our radio-tracking shows that this is because individual toads at the front travel long distances (sometimes more than a kilometre) each night – and do so every night. This is an incredible rate for an amphibian: cane toads at the Aussie invasion front travel much much faster and further than any other frogs or toads that have been studied elsewhere in the world. Why are the toads moving faster and faster? It’s probably a direct result of the pressures that flow from being an invader. Every generation, there is a continuing “selection pressure” in evolutionary jargon. That is, the only cane toads that got to be at the edge of the invasion front after the first year post-release (1935) were the fastest-moving animals. And the next generation, the only animals at the invasion front were the fastest-moving offspring of those fastest-moving toads. And so on, and so on, year after year. The end result was that the toads at the front are the ones who have evolved to be quicker and quicker – and better and better at spreading quickly. Any gene that tells a toad to slow down, to rest, to travel back the way it was going yesterday, will end up being left behind. And the inevitable result of that process is that the toads are accelerating – from 10 km per year in the early years, through to 50 km per year today. Listen to Rick talking with ABC Radio's Tony Eastley on the AM program about the toad invasion. An interview with Rick in THE AGE about the cane toad invasion. One of the most amazing recent developments in the cane toad invasion is their spread into the very dry parts of western Queensland. Toads are now firmly established around the Longreach area, and one population (deliberately introduced - some people never learn!) is all the way into the desert around Windorah. The toads are also moving into desert regions along the Victoria River, in the Northern Territory. Team Bufo has conducted research in both of these areas, to help understand how a giant frog from the Amazon rainforests has been able to colonise such dry and difficult environments. And there is clear evidence that cane toads are rapidly adapting to harsh Australian conditions. While he was a post grad student with Team Bufo, Reid Tingley radio tracked cane toads in the desert landscape around Longreach in western Queensland. 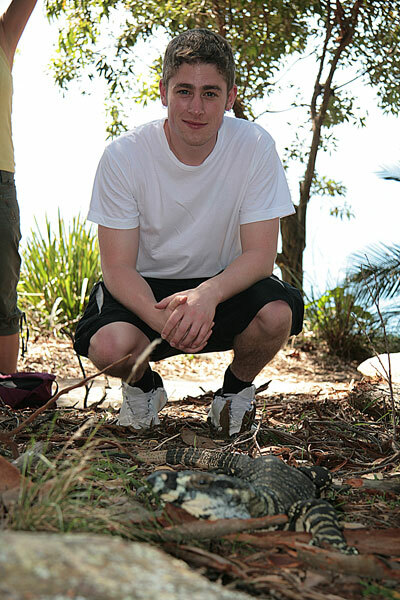 Reid survived his Ph D, is now at the University of Melbourne (photo by Terri Shine).